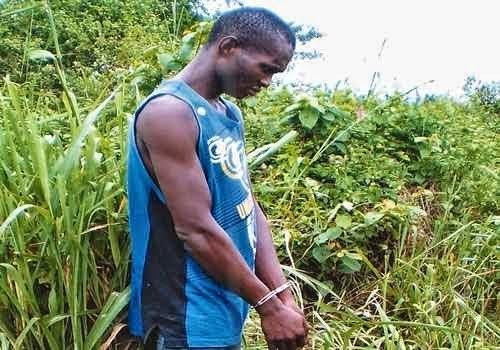 According to a report by Tribune, a 29-year-old man named Kingsley Ekerete (pictured above), has been arrested for killing his own 7 year old daughter over a plate of boiled rice in Obimama, Oyigbo LGA of Rivers state. Kingsley, a commercial driver who hails from Nto Osung community in Ikot Ekpene Local Area of Akwa Ibom State, holds just a First Leaving Certificate and has to drive his bus daily through the bustling traffic of Port Harcourt to make ends meet and put food on the table for his young family. On this fateful day of April 12, 2014, Kingsley returned home like every other day at 1900hrs, already famished. He hurried down to the pot of rice he had prepared before leaving for work only to find that his also hungry daughter, Favour, had helped herself to the meal he had reserved for himself. Kingsley’s animal instincts became awakened and what followed were fits of mad rage as the red-eyed father unleashed his beastly tendencies on his seven-year-old daughter. Little Favour Ekerete, who had been ill before this time, cried herself to sleep and her illness worsened as a result of the beating she received from her father. According to Kingsley’s own confession, she died some hours later. He then proceeded to place the corpse at a corner of his one-room apartment, an apartment that also housed his two other children aged two and three, not even giving a thought to the implications of keeping the dead child with her frightened siblings. The kids bore the ordeal as the remains of Favour spent a whole night with them before their father, having made sure his neighbours were all fast asleep, wrapped the corpse in his own clothing, took a shovel and buried it in a shallow grave behind his room. But Favour’s spirit must have cried out from that shallow grave for justice, for as much as Kingsley tried to cover his crime, he was soon found out. One Ugwu, the caretaker of the building where Kingsley resides, noticed the strange and sudden disappearance of Favour, who had been the darling of neighbours. She (Ugwu) quizzed her father about her whereabouts and the latter spun a story of how the child had taken ill and how he had taken her to a hospital in neighbouring Umuebulu community where she had died. But Ms Ugwu insisted on seeing the corpse, which Kingley blatantly refused to oblige her. She then threatened to report to the police. But before then, she informed a neighbour, one Pastor Emeka Onuoha, of the situation. While this was going on, men of the Afam Police Division who were on patrol were flagged down by the pastor. Kingsley was arrested and, after interrogations, was transferred to the State Criminal Investigation Department, Rivers State. In an attempt to cover his crime, Kingsley gave different accounts to the police, claiming that the mother of his children abandoned him to take care of their ailing child alone and the child had died for lack of attention while he toiled for find money. Yet in another account, he claimed that being so poor, he had deposited his mobile phone with a Hausa rice seller in order to get the rice that he had prepared to feed the children, not knowing that the rice had been poisoned. When asked to lead the police to the location of Favour’s corpse, he also gave conflicting accounts. He first said she had died on the way to the hospital and so he buried her somewhere along the way and couldn’t remember where it was. Then he later said that the body was in a mortuary at a neighbouring village. But the truth was unfolded when his parents, Mr and Mrs Ekerete, visited the State Criminal Investigation Department (SCID). They told the police of Kingsley’s strange behaviour even toward the mother of his children, who ran away from home to avoid his excesses. Kingsley’s father also narrated how his son had called him immediately after the child’s death. He has since taken the police to the site where he buried his daughter in a grave so shallow that the corpse is visible even without exhumation. Speaking on the development, the Commissioner of Police, Tunde Ogunsakin, explained that his men, after receiving the case file from Afam Police Station, noticed that Kingsley’s explanation on his missing daughter was suspicious and that efforts to reach the mother of the deceased was rebuffed when police started investigation. He said that this is a case of homicide and that considering the nature of the crime, Kingsley would need to go through a psychiatric test before he is taken to court for prosecution. According to Ogunsakin, the Child’s Rights Act Sections 4 and 14 state that this is a violation of the child’s right to survival and development as well as parental care and protection.